Today for brunch, I created a mash-up of two of my favorite egg dishes: Spanish tortilla, a thick omelet with potatoes, and Japanese tamagoyaki, a rolled omelet infused with a slightly sweet soy and dashi broth. 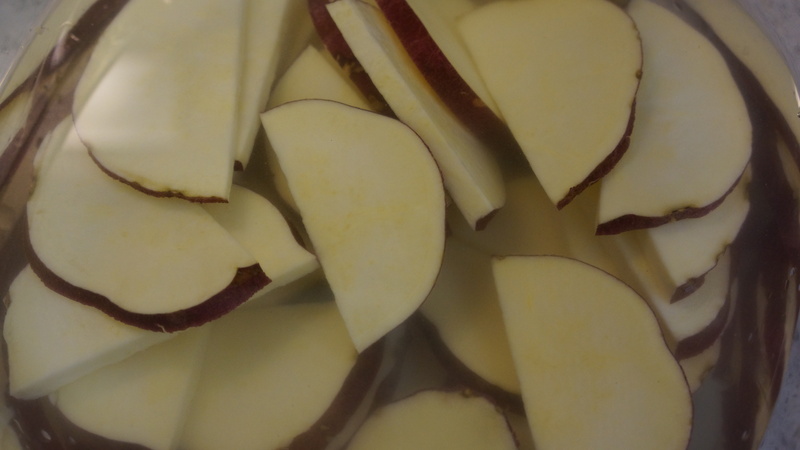 In place of regular potatoes, I use satsumaimo, a kind of Japanese sweet potato that is whiter and a bit firmer than American sweet potatoes. Of course, you can use whatever sweet potato you can find. I pre-cook the satsumaimo with a kind of delicate simmering technique called nimono before incorporating it into the omelet. The recipe takes a bit of time to make from scratch, but the techniques are simple. I think it’s worth the effort and the perfect way to impress your family and friends with a fresh take on the usual weekend brunch fare. Rinse the shiitake, kombu, and ginger and place in a medium saucepan with about a liter of cold water. Bring to a simmer, and cook gently for 30 minutes, uncovered. 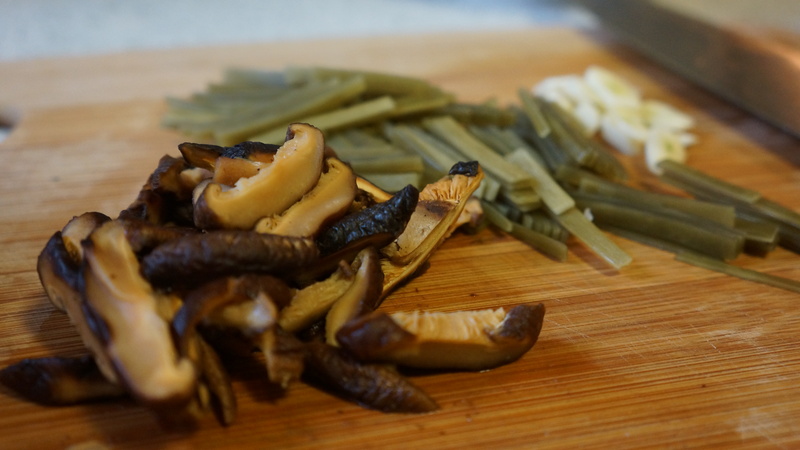 Pick out the kombu and mushrooms and reserve. Leave in the ginger. Bring to a boil and toss in the katsuobushi. Turn off heat, let cool for 10 minutes and strain. Discard katsuobushi and ginger. Add 2 tablespoons of soy sauce and sugar, 1 tablespoon each of mirin and sake. Add salt to taste. It should be salty and a bit sweet but not too overwhelming. While the broth is simmering, cut the satsumaimo into 1/4 inch-thick half moons. Leave the skin on, but trim off any dried-out or dark bits. 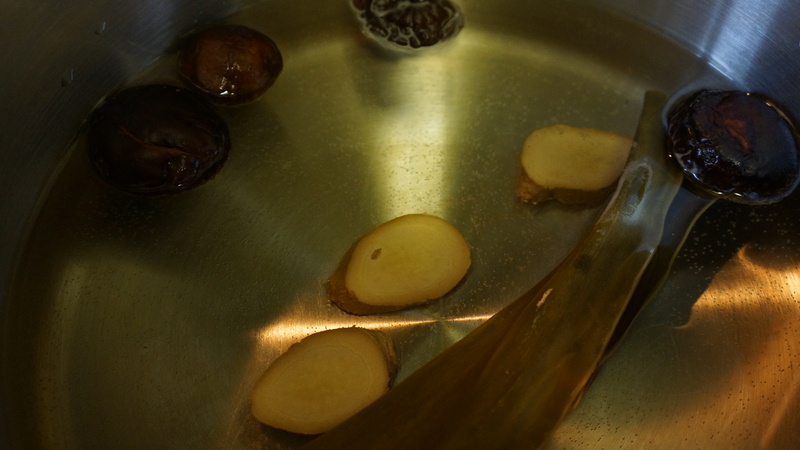 Soak the satsumaimo slices in cold water until ready to use. 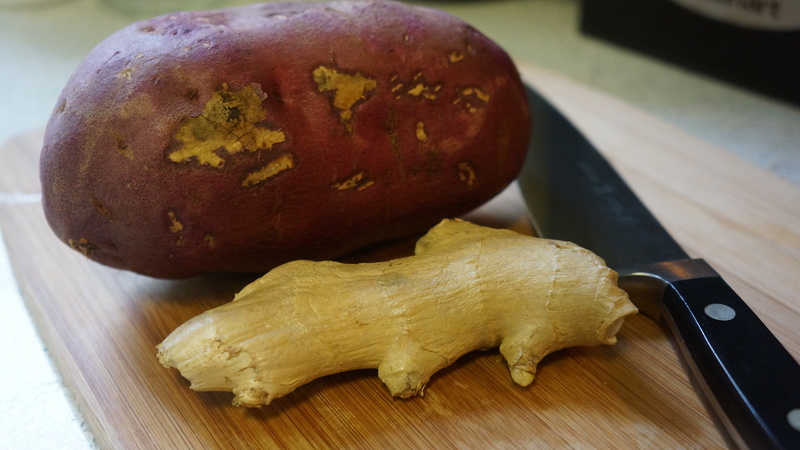 This removes some of the extra starch and prevents oxidation, which turns the sweet potato brown. Drain the satsumaimo slices from the cold water and simmer in the broth from the previous step for 15-20 minutes until soft but not falling apart. Remove satsumaimo from cooking liquid, reserving some of the broth. 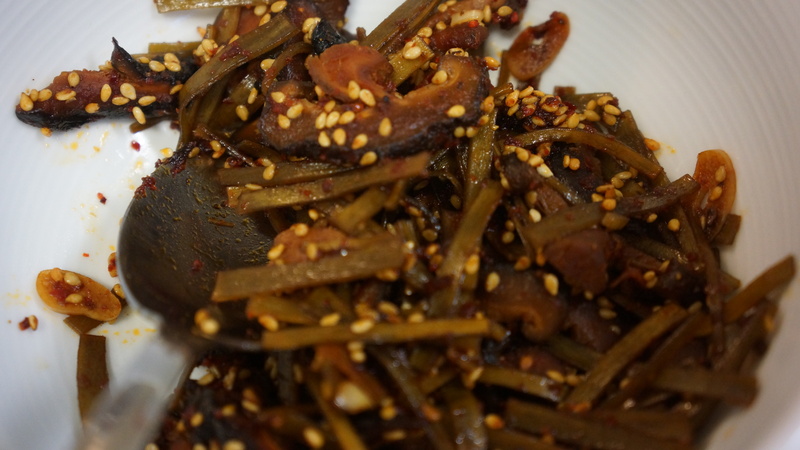 While the satsumaimo is simmering in the broth, prepare the crunchy mushroom and kombu topping. Thinly slice the kombu and shiitake reserved from the broth making. Heat about a teaspoon of the sesame oil in a small saucepan. Add in the sliced kombu and shiitake along with the sliced garlic. Season with a few pinches of red chili powder and/or cayenne, freshly grated black pepper and sugar. Add a small splash each of sake, mirin, and soy sauce. Cook until liquid is absorbed and mixture looks dark and crunchy. Sprinkle on white sesame seeds. Whisk 1/4 teaspoon of yuzukoshō and the scallion in about 1/4 cup of the reserved simmering liquid. Beat in the eggs. Heat a well-seasoned cast iron pan on a medium flame and coat with a thin layer of olive oil. Add the egg mixture, then add a layer of the satsumaimo slices. I had some extra sweet potato that I saved for another use. 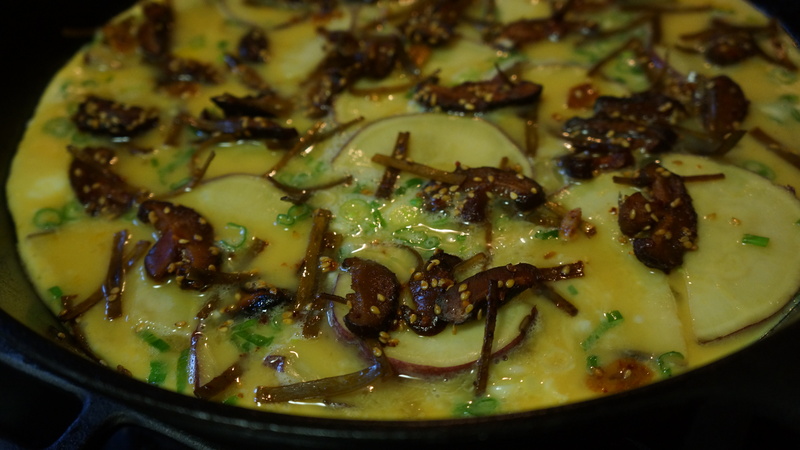 Then add the kombu and mushroom mixture on top. Continue cooking on low heat until edges look slightly solid. Finish in the broiler (1-2 minutes). The eggs should still be a little runny in the center. Drizzle with olive oil, sprinkle with pimentón, and serve. Enjoy!